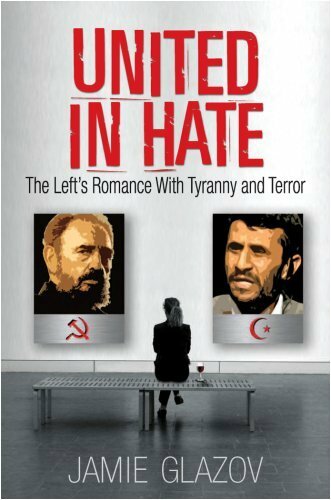 United in Hate analyzes the Left's contemporary romance with militant Islam as a continuation of the Left's love affair with communist totalitarianism in the 20th Century. Just as the Left was drawn to the communist killing machines of Lenin, Stalin, Mao, Pol Pot, and Castro, so too it is now attracted to radical Islam.Both the radical Left and radical Islam possess a profound hatred for Western culture, for a capitalist economic structure that recognizes individual achievement, and for the Judeo-Christian heritage of the United States. Both seek to establish a new world order, leftists in the form of a classless communist society, and Islamists in the form of a caliphate ruled by Sharia law. To achieve these goals, both are willing to 'wipe the slate clean' by means of limitless carnage, with the ultimate goal of erecting their utopia upon the ruins of the system they have destroyed. One of the foundations of the Left's romance with militant Islam, as with communism, is the lust for death - for others. A Modern Day "Road to Serfdom"
Leftists like "I'm a dinner jacket"? In 2000, a near-total mainstream news blackout on hateful Islamic ideological violence and jihad drivers motivated my migration from financial journalism to covering Islam and the Middle East. Once convinced colleagues were ignorant of translation services providing statements from Arab, Urdu, Pashtan and Turkish clerics and media, I abandoned that naivet�� in the wake of a bevy of rude, angry replies to my letters. Newsmen, rather, suffered from near-universal animus to facts---and educating the public. Jamie Glazov's United in Hate provides the first genuine insight I've yet found into this phenomenon. This brilliant historian and Ph.D. in U.S., Russian and Canadian foreign policy identifies a seeming psychotic dementia opposed to liberal humanism and the Socratic method, whose victims worship varied Utopian ideologies, which they adamantly determine to reconstruct on earth, regardless the costs in human life. From everyman philosopher Eric Hoffer, Glazov borrows the label "believers" for the political theorists all possessing one psychological characteristic---a genus or DNA strand parallel, rooted in denial---a virulent, communicable hatred for human imperfection, and therefore everything and everyone real. Even nearly two decades after the Soviet Union's defeat, Glazov finds, believers continue threatening Western civilization. They've now married their animus for humankind to Islam's longstanding, toxic war against individual freedoms and its renewed jihad against the West. Believers (intensely committed to the communist death cult) attained shocking prominence. Wooden-legged drug user, "satanic sexual orgies" aficionado and U.S. outcast, New York Times reporter Walter Duranty, witnessed Ukrainian mass starvation in 1933, yet reported the situation as "not famine but abundance." Peasants appeared "healthier and more cheerful" than anticipated. Their markets overflowed with "eggs, fruit, poultry, vegetables, milk and butter." Journalist Anna Louise Strong covered Washington state's 1916 Industrial Workers of the World (Wobblies) riots, became a WWI I pacifist and in 1921 in Poland and Russia, metamorphosed into a Stalinist, immune to 1930s arrests and her friends' murders. In the 1950s, Strong migrated to China, where she died in 1970---still defending Mao's bloody cultural revolution. Playwright George Bernard Shaw, likewise "revered Stalin." In 1931 his Soviet minders introduced two train station waitresses "intimately acquainted" with his plays, convincing him that Russians were more literate than Britons. Potemkin village prisons built to fool idiots persuaded Shaw that ordinary English delinquents exited prison as "criminal types," while Russia made such people ordinary men. Few Kurt Weill fans may realize that Three Penny Opera collaborator Bertolt Brecht, a dedicated Marxist, opposed free expression. Art was meant "not to serve beauty or any other aesthetic value; [but] to destroy the old order and thereby enable the birth of the communist utopia." Intellectuals were all scum, "parasites, professional criminals, informers...." The more innocent, the more they deserved to be shot. Brecht allowed, there "must have been enough evidence" to arrest his lover Carola Neher, who was never seen again. More recent deniers include Noam Chomsky, Norman Mailer, Simone de Beauvoir, Susan Sontag, Jean Paul Sartre, Abbie Hoffman, Shirley McLaine, Mary McCarthy, newsman Dan Rather, author Gunther Grass, producers Oliver Stone and Steven Spielberg, actors Ed Asner and Michael Douglas and many others. Without "real economic hardship," and having all material comforts, educational opportunity and social advantages, "new left" devotees---like William Ayers (Students for a Democratic Society terrorist and Obama mentor since circa 1995)---all longed to redistribute wealth from evil capitalists to sainted "have-nots," with sangfroid for the deadly consequences. Longing for submersion into communal wholes, and their own deaths, believers throughout the 1960s, 1970s and 1980s adulated mass murderers in Havana, Hanoi, Beijing and finally Managua---while denying victims of Castro's vicious racism and homophobia, 80% of them black, and Cuba's 18%, post-1959 population decline. The also denied horrors, and mass starvation and murder at Hanoi's Cu Loc (nicknamed the "Zoo" and "Cuban program"); North Vietnam villages; in China; and in 145 Nicaraguan settlements, outside of which, Ortega ordered soldiers to ask no questions and shoot everyone on sight. With communism's fall, believers migrated to another death cult---jihad as exemplified in virtually every Islamic terrorist organization. In Islam, Algerian radical Ali Benhadj notes, "If faith... is not watered and irrigated by blood, it does not grow. It does not live. Principles are reinforced by sacrifices, suicide operations and martyrdom for Allah." Islam commands Muslims to commit violent jihad. "Myriad Koranic verses emphasize the importance of fighting unbelievers," Glazov notes. For example, the "famous Verse of the Sword," (Chapter 9: Verse 5) nullifies all non-violent passages and instructs Muslims to seek and obtain global "hegemony." Unfortunately, Glazov reaches this discussion only after seeming to suggest that recent jihad arose from Nazism and Communism and Islamic Antisemitism from European Jew-hatred---both, mistakes. Mohammed initiated Islam's virulent hatred of Jews and Judaism, as becomes eminently clear in Dr. Andrew Bostom's brilliant Legacy of Islamic Antisemitism: Islamic affinity for Nazism also sprang from Islamic ideas, not the other way around. Hitler himself identified with Muslim thinking and numerous Nazis later converted. Nevertheless Glazov correctly notes that Islam was perennially rooted in jihad ideology and recognizes Western Marxist believers' adoration for Islamic "purification through mass death," despite their failure to understand Islam. They denied every Marxist horror in previous eras (described here in detail). Now, their rigid secular worldview likewise prevents their comprehending that Islamic violence "has absolutely nothing to do with economic inequality, class oppression, or Western exploitation." They demonstrate "an obvious and profound racism," Glazov observes---considering Muslims and Arabs inadequate "to understand their own circumstances." Despite Muslims' frequent citations of Koranic directives ordering them to make Islam a global empire, believers reject their explanations---as if Muslims seriously can't understand their own theocratic, imperialist ideology. Perhaps Islam can be reformed, as Glazov posits---and a dedicated few do hope to turn Muslim minds away from hatred and violence. "Human rights is not negotiable, even for God," says one moderate Muslim I recently met. "Otherwise, Islam is a only a cult." But those few cannot change what is hidden, unrecognized, unknown---and largely denied by their potential Western allies. A handful of Muslims fighting impossible odds to promote secular Islam and reform their coreligionists' thinking requires gargantuan efforts. All this makes Glazov's book critical to everyone who cares about the survival of Western civilization. As Supreme Court Justice Louis Brandeis noted, "Sunlight is the best disinfectant." And this book provides much sunlight. Defintitely a five star! Finally, someone has been brave enough to write the truth about the Left's romance with tyranny. Jamie Glazov in United in Hate offers an illuminating account of the danger of the Left's belief's and "contorted thought processes. I would agree with the word "contorted, "but certainly not with "thought." These are a group of people who do not "think" are thoughtless "thinkers." It is clear to Glazov that after 911 America has curbed their enthusiasm about war. These are people who only see a partial picture and respond to such group fantasies as being "do-gooders" as they cite in unison such mantras as "War Criminals," "Peace Not War! " "Murderers!!" The Leftists should not be rewarded with a word like "think" or thought, or as Wilfred Bion, a famous analyst describes "thoughts without a thinker. The danger is not so much how they think but how they avoid thought by joining up with the masses, "cult-like" behaviors and the perverted way in which they project their rage. Yes, Glazov does cite the danger in idealizing such narcissistic leaders as Obama and Clinton, but although he has many analytic insights, I do not think he has expanded enough the in-depth concepts that goes on in group psychic mentality. Hitler is a good example of how he can coerce an entire society to idealize him as a group leader, a charismatic leader they not only worship and provides some unconscious fantasy of become the savior/ the rescuing father from the external enemies--the Jews! . In the case, to rescue a group of liberals from their guilt of comfort and having too much. So under the guise of peace, love to all, and change, the left has found justification to act out their most vicious and hatred toward their own country--Amerika! Wouldn't if be nice if the same voices screaming out for choice and gay rights could be the same voices should shouting for human rights and women's rights against governmental abuse and terrorism in the Middle East! As a psychohistorican and psychoanalyst, I cannot help reading this book through the lens of a clinician. I have often questioned, does the Left have a mental disorder. Although Glazov does not suggest this directly, he implicitly suggests this syndrome in his chapter "The Believer's Diagnosis, which validates that there is such a thing as a collective diagnosis, a group of people who join together and share a mutual common belief system. Although Glazov does not put the Left on an analytic couch, he does offer many insights that provide deeper understanding why a group of people would support evil and betray their own country, he is clearly just as baffled as we are how hordes of famous people living in wealth and comfort, including intellectuals, authors, movie stars, professors, repudiate freedom and embrace tyranny and the shift to the left. Author of The Narcissistic/Borderline Couple, The V-Spot and How to Talk to a Narcissist, and The Psychopathology of Terrorism. I found the book entirely compelling, scholarly, well-researched, and well-written. The reviews giving this work five star are correct and in the case of several, almost as compelling as the book itself. They are definitely worth reading by themselves. Author Glazov tells us that the far-left loves violence and blood, and revels in denigrating the United States and would see it destroyed as soon as possible. When one considers that George Soros has no remorse in aiding the Nazis in confiscating Jewish property as a youthful Jew, then why would he and those like him blanch before the destruction of the US? For years now I have referred to the far-left fanatics mentioned by Glazov as simply belonging to the BAFEs (Blame America For Everything), but then I failed to understand the their defective mental processes. The author literally explains the twisted reasoning of these people that one reviewer has been so good as to enumerate by name, and frankly I find his logic and evidence proven beyond any reasonable doubt. So why not five stars? There are two things missing from the author's work: a conclusion and a recommendation on dealing with the problem posed by these mentally unbalanced individuals. If I were a betting man, I would give the US less than a twenty percent chance for survival under our current conditions -- apparently not a conclusion the author wished to express. If Islamic jihadists don't get us, then China will. And no one wants to talk about this 1,000 pound gorilla in the living room that already controls the financial key to our economy. The second question concerns a plan for overcoming the forces of evil these people represent or at least surviving their attacks. Clearly the US can not exterminate these individuals as would happen under a totalitarian regime (proof the US is good by definition), nor can we simply give them all lobotomies. And it's far too late for re-education since our education system has been slanted to producing the aforementioned crazies since World War II, and unaffected people are now decidedly in the minority. So as Lenin said, "What is to be done?" The author offers no cogent answer to this problem, and neither can I. The case can be made that the Confederacy died of States Rights, and it looks like the US will die of freedom. The left does not want freedom as they are singularly unable to cope with freedom and the individual responsibility it entails. They must have a bloody and repressive state (in which they see themselves as an elite or martyrs) where they can feel at home. They hate themselves, so they hate those next to them who enjoy and extoll their freedoms. Think of yourself walking down the street and seeing someone like Bill Ayres coming towards you. Remember, he hates America and all that it stands for. Do you really think he will allow you to stand in the way of its destruction? One can only pray that ineptitude is a characteristic of these people. But after Obama's election it seems that they have recruited others who either are fellow travelers towards their destination or are seduced by the prospect of a tyranny replacing a system which they see as increasingly flawed and troubled. They are incapable of recognizing that the cure will be worse than the current disease. Maybe that's why ammunition has disappeared off the shelves of retailers across the US and even from the catalogs and web sites of wholesalers and distributors. Orders are backlogged for months, but is anyone noticing? Will this be the solution, another Civil War? And on whose side will the Army and the National Guard fight? In short, this is an extremely important book, perhaps the most important in a decade, and one that tells us that we are on the edge of a precipice. Clearly the far-left is attempting to push us over. Author Glazov has given us a descriptive analysis of the problem, but no plan of action for a remedy. It certainly won't come from Washington, the Congress or the Federal Government. I guess now that author Glazov has put the problem in terms that even the most uninvolved American can understand, it will be up to us -- the people. But I guess it always has been. United In Hate -- The Left's Romance With Tyranny and Terror is a book that examines the seamy underbelly of the radical Left which considers Western society and its values an anathema. Dr. Jamie Glazov, the Managing Editor of FrontPage Magazine, methodically details the causational factors that have lead modern Leftists to adhere to the death and destruction mantra of tyrannical Islamic Jihadists. The Twin Towers are destroyed, 2973 people die in the attack and the radical Left cheers; the war in Iraq is won and the Left expels a disgusted sigh; totalitarian thugs kill innocent millions that the Left justifies as a "cleansing" required to forge a utopian society; suicidal Jihadists shred shoppers in malls with nail bombs and are excused by the Left as door-matted victims striking back at their oppressors; women are vilified, stoned, mutilated and killed by radical Muslims as Leftist feminists remain silent, save here in America where they rail mightily against a country club that's denied membership to a female executive. What draws Leftists moth-like toward the annihilating fires of unbridled totalitarianism, or drives them to slavishly worship at the feet of dictators that kick them to the curb when they are considered no longer useful? Why does the Left cleave to a radical Islamic terrorism that vows to destroy all non-believers, including them? Dr. Glazov answers these and other "head scratching" questions in a court-ready presentation of the Left's mindset that will make forensic psychologists proud. The Left's hatred and rejection of Western civilization, its freedoms and values, begins with an acute sense of alienation from it, and unable to "fit in" the Left believes radical societal change, regardless of the consequences, is necessary. After all it's the West's fault that the Left has no sense of purpose or direction. Although the Left vehemently argues against this premise, its words and actions prove Dr. Glazov's case. The ideological descendents of the communist/progressive Left that spent its capital hoping the West would lose the Cold War to the Soviet Union are today's leftist core. Based on their hatred for the United States, the Left has forged a symbiotic relationship with radical Islam, whose hatred for America equals theirs. Both make it clear that they consider Western civilization evil and unworthy of preservation. Violent revolution is the Left's path to change; the Jihadists' follow the path of war and annilation. Some might think Dr. Glazov has taken a wrong turn in his analysis of the radical Left's agenda and beliefs. If so, they should read the scurrilous quotes of Michael Moore extolling the virtues of the "Iraqi freedom fighters," or Ward Churchill's and Jeremiah Wright's crowing after 9/11 that "America's chickens have come home to roost." Or, they should examine the genuflexing before the world's tyrants by the likes of Jimmy Carter, Sean Penn and Tom Hayden. Dr. Glazov's take on the radical Left is correct and as sharp as a tightly focused laser. Should the book cause even one radical Leftist to re-examine his or her contorted beliefs and return from the "dark side," Dr. Glazov's efforts will be a resounding success. A great thought provoking read! I just heard the author on a radio interview today and was highly offended. The author picks EXTREME leftists and tries to paint all progressives with the same brush. NO ONE I know was dancing with joy in the streets over the 9-11 attacks. An exceptionally thought provoking book on the American Left. Dr. Jamie Glazov has written an exceptionally thought provoking book on the American Left. He examines their serial worship of successive tyrants and mass murderers and demonstrates repeatedly that they are willing to serve the most bloody and horrible people on the face of this earth as long as those people share the impulse to destroy America and Western civilization. He tracks the stupid (but deadly) claims of many on the Left in support of the most recent bunch of bloodthirsty mass murderers. He castigates: Ed Asner, Bill Ayers, Harry Belafonte, Medea Benjamin, Daniel Berrigan, Julian Bond, Pat Branson, Naomi Campbell, Jimmy Carter, Noam Chomsky, Ward Churchill, Ramsey Clark, William Sloan Coffin, Francis Coppola, Harvey Cox, Joseph E. Davies, Christopher Dodd, Bernardine Dohrn, David Dillinger, Michael Douglas, Theodore Dreiser, Walter Duranty, Andrea Dworkin, Richard Falk, Norman Finkelstein, Jane Fonda, Eric Foner, Nicholas De Genova, Allen Ginsburg, Michael Harrington, Tom Hayden, Abbie Hoffman, Gerald Horne, Aldous Huxley, Bianca Jager, Ted Kennedy, John Kerry, Barbara Kingsolver, William Kunstler, Gina Lollobrigida, Staughton Lynd, Shirley MacLaine, Norman Mailer, Herbert Marcuse, Mary McCarthy, Cynthia McKinney, Margaret Mead, Michael Moore, Jessica Mitford, Jack Nicholson, Barack Obama, Nancy Pelosi, Sean Penn, Linus Pauling, Harry Reid, Jerry Rubin, Mark Rudd, Bernard Sanders, Susan Sarandon, George Bernard Shaw, Cindy Sheehan, Upton Sinclair, Susan Sontag, Steven Spielberg, Dr. Spock, Gloria Steinem, Lynn Stewart, Oliver Stone, Anna Louise Strong, Paul Sweezy, George Wald and a hundred more for spouting nonsense. Not all these folk have the full set of symptoms, but there are strong threads of alienation from their own culture that suggest a form of mental aberration that makes objective observation and evaluation impossible. The range of intelligence in the group is extreme, proving that these delusions are not linked to overall intelligence. Noam Chomsky is certainly first class when talking in his field of linguistics, but does not display the evaluative good sense of a child when talking politics. These folk obviously have such a warped imagination about the society in which they live, that for most, only it's destruction will suffice. Their fevered imaginations provide only the most general and fantastic ideas about any replacement society. Their utopia often contradicts all human experience by such a large margin that it is apparent that it is by no means intended as a real goal. For many on the Left, submerging themselves in a totalitarian movement provides a sense of purpose and meaning to their life. Many in fact can relate to Islamic suicide bombers since their strange psychology contains a wish to sacrifice all for the cause. Leftists claim to be irreligious, but readily ally themselves with religious tyrants if they offer a possibility of destroying Western society. Glazov provides personal histories demonstrating the movement of the same people giving their allegiance to one tyrant after another. These folks usually settle for a while on whoever is willing to shed the most blood to purify the current world. After reading this book, you will often reflect on the differences between what Leftists say and what their actions say about them. Mr. Glazov's book presents a very interesting hypothesis about why priviledged elements in Western societies support totalitarian communist and religious extremist movements based on years of observation and study. Glazov writes (p. 6): "The believer's totalitarian journey begins with an acute sense of alienation from his own society - an alienation to which he is, himself, completely blind. In denial about the character flaws that prevent him from bonding with his own people, the believer has convinced himself that there is something profoundly wrong with his own society - and that it can be fixed without any negative trade-offs. He fantasizes about building a perfect society where he will, finally, fit in. " Also: "A key ingredient to this paradigm is that the believer has failed to rise to the challenges of secular modernity; he has not established real and lasting interpersonal relationships or internalized any values that help him find meaning in life. Suffering from a spiritual emptiness, of which he himself is not cognizant, the believer forces non-spiritual solutions onto his spiritual problems. He exacerbates this dysfunction by trying to satisfy his every material need, which the great benefits of modernity and capitalism allow - but the more luxuries he manges to acquire, the more desperate he becomes. We saw this with the counterculture leftists of the sixties and seventies, and we see it with the rdical leftists of today. Convinced that it is incumbent upon society, and not him, to imbue his life with purpose, the believer becomes indignant; he scapegoats his society - and ends up despising and rejecting it." Also (p. 7): "Tortured by his personal alienation, which is accompanied by feelings of self-loathing, the believer creates a fairy-tale world where no individuality exists, and where human estrangement is thus impossible. The believer fantasizes about how his own individuality and self will be submerged within a collective whole." Thus the totalitarian believer ties to end his unwanted individuality. Mr. Glazov in the rest of his book developes and substantiates this interesting thesis. He produces a very readable and interesting work. The thesis and book of Mr. Glazov should be read by all interested parties. This thesis also should be objectively examined, tested, and perhaps modified by other interested observers. By these means truth can be discovered. For many the interesting and important book of Mr. Glazov is a must. Sorry, The premise of your remark is idiotic. Leftists USUALLY employ religion as did Hitler with "GOTT mitt uns"
What leftists hate is truth. Thus they hate true Christianity when practiced as it should be. But all other religion is fine with them. The book did stir you up and clearly you are part of "the nut case base"
"Any leftist who reads this, and has any honesty left in his mind, must recognize himself in this picture and, hopefully, be ashamed," adds Vladimir Bukovsky, once a leading Soviet dissident and author of "Judgment in Moscow." Jamie Glazov on 9/11 was astonished to see that some of his Leftist friends were actually happy at the disaster. He immediately begin to think about the present book, one which analyzes the Totalitarian sickness of our time, the alliance between the Radical Left and the Islamists. Why do people of the Left whose fundamental code of values should be in direct opposition to the misogynistic, liberty- hating , Islamic fundamentalists embrace them? Glazov sees the story as one of Alienation and Resentment. The Radical Left hate their own societies which they can never feel a part of. The Radical Left's embrace of the Islamists is an embrace of another party whose aim is to bring down Western Democracy. Glazov has for a number of years now as Editor of Frontpage. Com been on the front- lines of this struggle. He has spoken to many of the leading opponents of the Totalitarian Alliance. He also coming from a family of Russian dissidents understands the Marxist Communist ideological role at the heart of the Left's attack on the West. And he understands too that the Islamists have come and replaced the Soviet Union as the largest Totalitarian threat to Mankind. Glazov writes clearly and with strength. This book is rich on insights on a wide variety of battlegrounds of the war between those who cherish Freedom and those who would fit Mankind into their own small Ideological prison. While this book goes a long way towards explaining the paradoxical alliance between Radical Left and Radical Islamic and neo- Nazi Right one still wonders how so many decent people , especially of the Liberal Left, have not raised their voices against this Evil. This is a passionate book written by an expert who obviously cares deeply about the future of our civilization, and about the future of humanity itself. Dr. Glazov's book is a hard-hitting, well documented expose of the politics of the left, exploring the dangers, contradictions, and the underlying evils of leftist thought. Glazov attempts to answer some of the most difficult questions in a clear, concise, reasoned, and well-documented way. Why do leftists, who are apparently in favor of human rights, support and abet repressive, murderous, and tyrannical regimes? How is it that Marxist feminists ignore and trivialize the barbarisms inflicted upon women who must live under gender apartheid in so many countries? Why is it that homosexual "peace activists" agitate in defense of societies that brutalize and murder homosexuals? What motivates people like Noam Chomsky, Naomi Klein and many other well-known "progressives" to behave in the morally inverted way that they do? How can these kind of behaviors even be possible? A great read, a bit overcomplicating about things, but valuable anyway. The book is great. Everyone should read it. But the answer is really simpler than the book would indicate. Liberalism is all about appeasement. Liberals love to "understand" why the bully is "angry". Liberals love to defend any "bad guy" who wants to "fight the white man's world." Islam is the ultimate ultra-violent fantasy where absolutely zealous revolutionaries commit to destruction even if they have to self destruct. Bill Ayers is pat for that kind of commitment. But, why aren't the liberals scared themselves? And what comes after capitalism is defeated? The Muslim has no moral obligation to be truthful, honest or fair with anyone who is an unbeliever or infidel. Treaties, agreements, contracts, promises, pacts or oaths are made with the infidel world only to serve the ultimate motive of bringing it into submission to Allah. Thus, in Islam, as in radical Marxism, the END JUSTIFIES THE MEANS. What a delicious irony perhaps because it means the Muslims are playing the liberals at their OWN GAME, using victimology as the bait. Or maybe liberals aren't fooled. Maybe secular leftists wouldn't object to living in a Muslim version of utopia, in terms of economics. Maybe they hope the social issues can be worked out later. The main thing is just getting rid of the West. Then we sort out scientific inquiry and gay marriage and diversity issues later on with the newly moderate global Islam. The left's self-ease about Islam may also signal their concept that Islam is the PERFECT spiritual vehicle for their global utopia. Simple, non-esthetic. Spartan and austere. Fatalistic. The perfect "pacifier" for peasants needing spiritual balm in the fields and factories. An all-embracing cultural backdrop. Socialists are NOT hostile to all religions, after all. Only to those who resist like Tibetan Buddhists, or to those who assert God-ordained rights like Protestant Christians. The Soviets came to realize religion was a necessary entity, and desirable if properly controlled. Even in North Korea there exists a church and temple or two. For one, religion is a hat rack to hang traditions on. Nice for weddings and other milestones marking the lives of peasants and craftsmen. Something to make them feel human. Islam does not recognize any "seperation of church and state", it lends itself to political uses as much as it overwhelms political life. When controlled by a strongman like Saddam Hussein, every mosque can be a propaganda outlet. Every cleric or imam is a purveyor of submission. Islam is an activist orthodoxy, just like liberalism. A perfect fit. Islam discourages non-conformity. It discourages dissent. It discourages intellectual musings outside safe boundaries. But it bestows a mantle of "clarity" on the individual as a serious student of life and living. A perfect fit. Islamic culture saturates the masses with a collective zealotry that is easy to focus. For the angry man there is justification; for the wayward man there is discipline and structure. Perfect fit. Islam encourages the "virtue" of accepting one's lot in life. Of fatalism. The starving child starves because it is the will of God. We are poor but we are in submission to Allah. Do you see the usefulness of this philosophy in a Marxist structure? Perfect fit. Islam does have the promised Messiah and his chosen princes who are to be feared and obeyed absolutely. That's another plus that might be a perfect fit. Last but not least, Islam is all about speedy justice and severe punishment without inhibition toward all who disobey the "authority". A perfect fit. Secular liberals could actually convert to Islam if required... without really converting. Believe it or not. Islam really isn't all that strict after a certain degree to those INSIDE its walls. You acknowledge Mohammed, profess Allah as the one God and you are a Muslim. Nothing after that is REALLY crucial, because Islam doesn't embrace the idea of "original sin" or even "sinfulness". You can fake it as long as you make a modest effort to go through the motions of piety. Nothing outside the normal realm of social politics we understand in the Western world. The left may very well succeed in overthrowing the West, but they in turn will turn over to Islam either by choice or by force. And then, who knows? Why does an openly oppressive theocratic movement appeal to those who enjoy the benefits of freedom, especially to so many of the highly privileged adhering to an ideology which claims to oppose everything that religion represents? This book reveals an unholy alliance and the motives of westerners that hate their own society, often expressed in their own words. Alain Besan?on's seminal study of Communism, Nazism and the Holocaust is called A Century of Horrors. Jamie Glazov connects the dots between the totalitarian massacres of the 20th century, murder in the name of religion and the mutual attraction between the radical left and radical islamists. As Eric Hoffer has shown in The True Believer, movements are interchangeable to a surprising extent. Both the radical and the reactionary hate the present. The temperament, not the ideological content, is crucial: fanatics often move from one form of extremism to another: communism, fascism, xenophobic nationalism, religious intolerance. Part 2, titled Romance With Tyranny, charts the love affair between western leftists and murderous regimes throughout the 20th century. Intellectuals and celebrities venerated monsters like Lenin, Stalin, Mao, Castro, & Ho Chi Minh. The New Left of the 1960s didn't have a change of heart, just a change of icons from Stalin to third world tyrants. The homicidal and sadistic Che Guevara is still held up as a hero whilst leftards never tire of Cuba's supposedly superior health system. After the communist victory and resultant slaughter in Vietnam, few of Hanoi's western supporters expressed shock or regret. These true believers do not care about the victims who are merely eggs to be broken in order to create the perfect utopian omelet. The last communist hope in Nicaragua was shattered by Ronald Reagan. After that, the collapse of the Soviet Empire left the Left aimless. The ideological offspring of the 'progressives' that were hoping the West would lose the Cold War became the nihilist leftovers of today. Hatred of the United States is one great attractor. Jihadists share a desire for cathartic violence with radical leftists; that's why the latter could not conceal their glee in the wake of 9/11. They blamed America and opposed the US campaign to oust the Taliban. The lust for sacrifice remains, expressed in loathing for Western culture, for capitalism, for the West's Judeo-Christian heritage and for Israel. Glazov shows how modern Islamism was incubated by both Nazism and Marxism. In the 1930s the Mufti of Jerusalem, Haj al-Amin al-Husseini, became a supporter of Hitler, eventually settling in Berlin where he encouraged the annihilation of European Jewry, hoping to become the leader of the Arab world in expectation of an Axis victory. The Mufti promoted Nazism amongst the Arabs, blending National Socialism with fundamentalist Islam. After the war he fled to Cairo where he accommodated fleeing Nazis and planned the destruction of Israel. Al-Husseini not only targeted Jews but also moderate Arabs and the democratic West in general. Nazism was the spiritual and physical bridge bringing ideological extremism to the Arab world. When the Soviet Union became the champion of the Arab cause, hatred of Israel started migrating to the Left. Arab leaders like Gamal Abdel Nasser, Saddam Hussein and Yasser Arafat were all influenced by the Mufti's ideas. The impulse to create an earthly paradise through human sacrifice is common to both secular & religious totalitarianism. Suicidal & homicidal martyrdom is the favorite expression of the radical desire for utopia. The Dragons Of Expectation by Robert Conquest is most illuminating in this regard. Bloodlust & anti-Americanism go hand in hand with anti-Semitism. All totalitarian ideologies despise modernity, the rule of law and the sanctity of human life, notions that emerged from Judaism. In addition, Jews personify individual achievement and love of life. Wearing different masks, the forces of evil are very similar in their methods and their madness. That's why the so-called 'peace protests' of 2003 were organized and led by both the Far Right & Far Left as observed by Nick Cohen, Julie Burchill and Christopher Hitchens amongst others. Ayn Rand called them collectivists, Bruce Walker calls them sinisterists but these followers of totalitarian ideologies are all the same. They employ the lie in order to attain power over our minds & bodies. The political spectrum is not linear but circular; there is a spot where the Far Left, Far Right and Radical Islam converge. Their latest idol is Mahmoud Ahmadinejad and his proxies Hamas and Hezbollah. Bernard-Henri Levy's Left in Dark Times confirms much of what Glazov exposes here - a global convergence of totalitarians of all stripes, united by their hatred of capitalism, individual freedom, America & the Jewish State. United In Hate concludes with notes, a bibliography and index. It's a worthy contribution to the growing body of literature which includes Eurabia by Bat Ye'or, Liberal Fascism by Jonah Goldberg, Unholy Alliance by David Horowitz, While Europe Slept by Bruce Bawer and Globalising Hatred: The New Antisemitism by Denis MacShane. Besides the fact that Jamie Glazov has written a masterpiece in the revelation of conspiring ideals and actions of tyrants, both theocratic and ideological, the sheer importance of the voices cited in his book as endorsements demonstrates that Mr. Glazov has produced a veritable treatise on the subject of the diversity and perplexity of global terrorism. As a conservative in all things pertaining to freedom, I highly value the knowledge I gained from this book, United In Hate. The title says it all and the diabolical linkage that Jaime Glazov reveals between those who kill for god and leftists who kill, because they think they are God. I really admire the way Mr. Glazov compared apparent contradictions, bringing out very clear and convincing proof that tyrants and fanatics have a natural affinity to one another. Glazov very wisely poses some astute questions in his book. He speculates as to why the leftists, who talk of rights for their fellow believers, find it so easy to wrap their arms around Islamic terrorists, the most gay-hating, woman-hating and minority-hating force on earth, today. He also pondered on why "progressives" heap admiration upon regimes under which they themselves would be eliminated. Why would Liberal women, who have a long history of talking about helping themselves right up to the highest rungs of the social ladder, ignore the suffering of millions of women living under gender-based Islamic oppression? `United in Hate' is a book that must be read by everyone who loves freedom and life. For those of us who are students of today's continually colliding worlds of East and West, Left or Right, Suicide Bomber or Social Engineers, it is a must read. `United In Hate' is not just another book written about Islam, nor is it a book that only rehashes histories about Stalin or Lenin. Jamie Glazov has written a book that goes beyond actions or words to expose the motivations of why these two natural enemies, Radical Islam and the Liberal Left, are caressing each other in a warm embrace of death. Glazov could not have expressed the dangers we face with an Obama Administration or the utter catastrophe that could erupt in America with current new occupants in the White House. Glazov stated, "United in Hate crystallizes the danger that a Barack Obama administration, if tilted too far left, presents to American security and global freedom." Get this book and let it guide you to a clear understanding of how Radical Islam and the liberal social terrorists have joined forces to create a world where free speech is rare and where individual achievement is discouraged, a world that only knows revenge without mercy; a world United in Hate.